Soul food. Not a desert island dish, but darn close. Our local organic basket kept sending us potatoes and leeks, so I decided to go with a classic. Glad I did. This recipe is everything you want potato leek soup to be. I substituted pareve beef stock for the chicken stock, to keep it kosher. (The beef bullion cubes I get at the supermarket are actually pareve; go figure.) 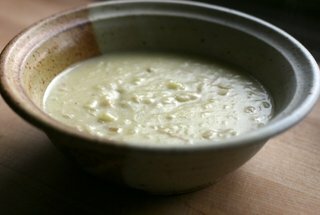 I also used 2% milk instead of heavy cream and it didn't seem to matter - this recipe is still super rich and luscious. I used French fingerling potatoes instead of russet, because that's what they sent me. And no salt or pepper, as usual. This may not be The Greatest Dish In The Entire World, but that's only because there's such stiff comeptition at the top. Next time I have potatoes and leeks in the fridge, I'm making this again.